The battery was delivered promptly and was well packaged. Physically, the battery looks great. Looks exactly like a Numax battery in construction. Only time will tell if it performs well, hence its difficult to award 5 stars just now. Note that its supposed to have a 4 year guarantee and the invoice serves as the guarantee receipt. The delivery was prompt and i was informed to the hour when it would be made. After a short top up charge i had a trouble free day's fishing using the battery to power my electric outboard motor. Brilliant delivery service! I ordered it about 4pm one day, and it arrived by courier around noon the next day. The battery needed charging for over 24 hours before it reached full charge, and I've not had chance to test its abilities in our caravan yet, so I'll reserve a 5-star rating for now. 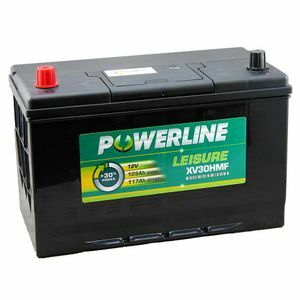 Excellent price for a powerful, sealed leisure battery of the size I need. Time will tell if it lasts as expected, though. Early days yet but all batteries seem fine. Next day delivery. Good price. Great all round service. Excellent discharge rate. Good voltage after 3 days use. Delivery fast as advertised. Would definitely recommend. Battery arrived promptly and was extremely well packed. It survived 4x days of TV use by 'er indoors in the caravan (no hookup) with no problems - early days but battery seems fine. All in all - excellent service from Tayna. Good service and delivery as described. Spoke to the help desk about the various battery options at 1430, ordered the battery at 1445 on Monday and the battery arrived 1130 Tuesday the next day! Excellent Service. Both batteries arrived next day as advertized 4 year garantee so time will tell! !